ClariFix® is the breakthrough cooling technology for treating frequent runny or stuffy nose, a condition called Chronic Rhinitis. Totum ENT is proud to announce they’re one of the first Ear, Nose & Throat practices in New York City to offer a new procedure that can bring long-term relief for your runny and stuffy nose, called ClariFix. The ClariFix procedure is for patients suffering from Chronic Rhinitis (CR), more commonly known as a runny nose. If you frequently have a runny, stuffy nose, you may have Chronic Rhinitis (CR). The ClariFix® procedure in your doctor’s office can mean long-term relief for your runny and stuffy nose. What is ClariFix and How Does it Work? ClariFix is a clinically-proven, minimally invasive option, which uses cryotherapy to treat your Chronic Rhinitis. 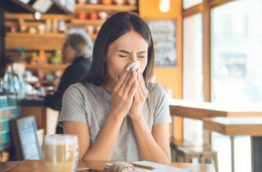 A small handheld device is placed endoscopically in the nose and uses a cryotherapy balloon to quickly freeze a small area that is often responsible for your frustrating nasal symptoms. No need to continue to rely solely on oral or nasal medications. The ClariFix procedure is safe, effective, and takes less than 30 minutes. In a clinical study, 4 out of 5 people reported long-lasting improvement with the ClariFix device, including a reduction in runny nose and congestion. A: In a clinical study of 27 patients, the cryotherapy was well-tolerated and patients reported an average pain rating of 1.19 on the Wong-Baker FACES pain scale (0 = minimum score, 5 = maximum score). A: In most cases, only topical or local anesthesia is necessary and patients can drive themselves back home. A: In general, there is minimal downtime and recovery. As with any nasal procedure, you may experience increased sensitivity, congestion and/or pain during the healing process. Q: How long until I see an improvement? A: Most patients begin to see improvement between 7 days and 30 days post-treatment. If you or a loved one are suffering from chronic rhinitis and are interested in learning if you’re a candidate for ClariFix, please click here to Book an Appointment or call 212-288-2222!